Along with the stupas at Boudhanath and Namo Buddha, Swayambhunath is considered by Buddhists to be among the most important pilgrimage places in the world. It was described by Kathok Situ Chökyi Gyatso (1880~1925) as “a sacred shrine of universal value for the people of the Indian subcontinent, unsurpassable for accumulating merit and good fortune.” Trulshik Rinpoche (1924~2011) said that the Swayambhunath Stupa carries the blessings of thousands of buddhas, and that it will continue to be blessed by all the buddhas of the current aeon. According to the Seventh Dalai Lama, this very stupa is the source of all the happiness in the world. The significance of this has led the Newar Buddhists of the Kathmandu valley to revere the site, while Buddhist practitioners from both India and Tibet have been gathering here for centuries, to pay homage. The site thus provides an intimate point of connection between the well-being of the buddhadharma throughout South Asia and its flourishing in Tibet as well. The origin of this stupa is recounted in the Swayambhu Purana, which details the history and significance of every major Buddhist site within the valley. For Tibetan Buddhists, this text has long been the main source of information on the sacred sites of Nepal. Manjushri, in his mountain abode at Wu Tai Shan in China, was attracted by the light radiating from the stupa, and paid a visit as the vajra-master Manjudeva. Enchanted at the sight, he drained the lake that filled the valley, so that devotees would have free passage and be able to worship at the self-arisen stupa. The place where his sword sliced through the surrounding hills is known as Chobar and can still be visited today. Many ages later, during the time of Buddha Kashyapa, the Indian king Pracandadeva left his kingdom of Gauda in the east and traveled to Swayambhunath, where he took ordination under the name Shantashri (Skt. Śāntaśrī; Tib. shi ba dpal). Concerned about the damage that people of this afflicted, degenerate age might inflict upon such a sacred site, Shantashri decided he must protect the stupa. He covered the original with rock, and built another above it, out of bricks. Thus emerged the stupa as we see it today, cherished by all the masters of our era. According to the Pema Kathang, Guru Rinpoche met Shakyadevi at Swayambhunath and later hid many terma treasures here. This is also the place where Marpa Lotsawa first heard of the name of Naropa and stayed for three years “to get used to the heat”, according to the instruction of his Newar master. It is also said that Thangtong Gyalpo traveled to the stupa in a single instant through his magical power. Five days later a rich person made large offerings to him, which he used to whitewash the stupa. At the head of the stairs is an impressive gilt vajra borne on top of a smooth base of gilt copper, representing the dharmadhatu, in the form of the mandala of Manjushri. It was placed there by the Nepali king Pratapmalla, who was also responsible for the construction of the two shrines and the eastern stairway in the 17th century. Right behind the main stupa, opposite the main stairway, is the temple of Hariti, Protectress of children. The site has inspired many superstitions and features in several legends. According to one account, there was once a time when everything in Nepal was going wrong, and after a while they found that the temple was damaged. But the people couldn't repair it. So they called the then Shamar Rinpoche, who had always a very strong connection with Swayambhu. He demolished the temple, as he was the only one with the power necessary to do so, and rebuilt it. 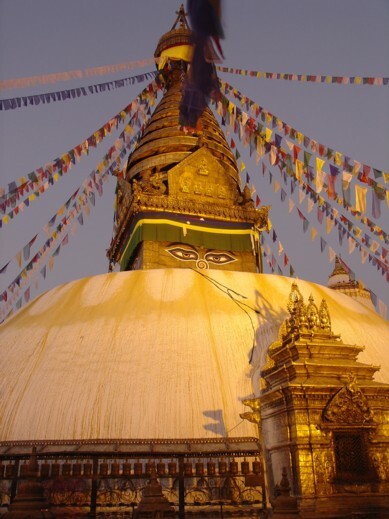 Behind the Swayambhunath stupa itself is an image of a standing Shakyamuni Buddha made of black stone. The Fourth Khamtrul Rinpoche, when he came here in the 1700s, said that this was one of the most sacred power places in the Kathmandu valley. There are many statues of deities and stupas of mixed Hindu and Buddhist content, of all dimensions. Most of these were sponsored by kings, brahmins, wealthy householders or other devotees from the valley. The Vasubandhu stupa is located in the saddle between the Swayambhu Hill and the Manjushri Hill, at the western entrance to the complex. The 4th Khamtrul Rinpoche (1730~1780) explained that it marks the site where Vasubandhu passed away, and that his relics were enshrined in this stupa. Down on the right from the main stupa is a building which houses—and also quite a lot under ground—a huge three-dimensional mandala of Chakrasamvara. There are five layers, according to the five kayas. Behind the door, there’s a little courtyard where people place offerings and so on. There are murals inside, which are centuries old and have been preserved quite well. Inside there are several doors going down into this huge mandala complex of Chakrasamvara. It is said to be the Chakrasamvara power spot in the Kathmandu valley. Once there was a king of Nepal who wanted to become the grand Maharaja of all Asia. So he came here to acquire some powers. He went inside, but didn't reappear for a number of days. When he came out he was completely insane. Whenever the inside is opened, the outside door is locked and people would usually rattle around [what?] and be ushered away. Only Newar vajra masters can enter the inner chambers. To the west lies the hill where Manjushri stayed with his two companions after draining the Kathmandu lake. He took the form of the vajracharya Manjudeva, here, and his disciples later built a stupa in this spot, dedicated to both Manjushri and his consort Saraswati. Bangdel, Dina. “Visual Histories of Svayambhu Mahacaitya: The Mandala Iconography of the Great Stupa.” In Light of the Valley: Renewing the Sacred Art and Traditions of Svayambhu. Edited by Tsering Gellek and Padma Maitland. Berkeley, California: Dharma Publishing, 2011. Decleer, Huber. "Situ Panchen’s Translation of the Svayaṃbhu Purana and His Role in the development of the Kathmandu Valley Pilgrimage Guide (gnas yig) Literature,” In Lungta 13: 46. Decleer, Huber. “The Tibetan Name of Svayambhu, 'Phags pa shing kun ('Sacred All-Trees'): What Does it Really Mean?” in Light of the Valley: Renewing the Sacred Art and Traditions of Svayambhu, edited by Tsering Palmo Gellek & Padma Dorje Maitland. Cazadero, CA: Dharma Publishing: 2011, 241–72. and its History (according to Tibetan sources)." In Ancient Nepal - Journal of the Department of Archaeology, Number 114, October–November 1989, 1-8. Ehrhard, Franz-Karl. “Further Renovations of Svayaṃbhūnāth (from the 13th to the 17th centuries),” Ancient Nepal 123-5 (April–September), 1991, 10-20. Heritage to Tibet.” In Les habitants du toit du monde. Hommage ά Alexander W. Macdonald, ed. Karmay, et Sagant. Nanterre: Société d’ ethnologie, 1997: 629-658. Kivelä, Sami. “The Sacred Hilltop: A Hermeneutical Case Study on the Svayaṃbhū Site in Kathmandu.” MA Thesis, Helsinki: Töölö Parish, 2005. Riccardi, Theodore. “Some Preliminary Remarks on a Newari Painting of Svayambhnath.” Journal of the American Oriental Society 93, no. 3 (1973): 335–40. Tsering Palmo Gellek & Padma Dorje Maitland (eds.). Light of the Valley: Renewing the Sacred Art and Traditions of Svayambhu. Cazadero, CA: Dharma Publishing, 2011. Von Rospatt, Alexander. “Altering the Immutable. Textual Evidence in Support of an Architectural History of the Svayambhū Caitya of Kathmandu.” In Franz-Karl Ehrhard and Petra Maurer (eds.) Nepalica-Tibetica. Festgabe for Christoph Cüppers. Band 2. Beiträge zur Zentralasienforschung 28,2. Andiast: International Institute for Tibetan and Buddhist Studies 2013, 91-115. Von Rospatt, Alexander. “Buddhist Strategies of Keeping it’s Sacred Images and Shrines Alive. The Example of the Svayambhū-caitya of Kathmandu.” David Park and Kuenga Wangmo (eds.) Art of Merit: Studies in Buddhist Art and its Conservation: Proceedings of the Buddhist Art Forum 2012. London: Archetype Publications, 2013, 275-85. Von Rospatt, Alexander. “On the Conception of the Stūpa in Vajrayāna Buddhism. The Example of the Svayambhūcaitya of Kathmandu.” In Journal of the Nepal Research Centre 11 (1999), 121-47. Von Rospatt, Alexander. “The Mural Paintings of the Svayambhūpurāṇa at the Shrine of Śantipur, and Their Origins with Pratāpa Malla.” In Benjamin Bogin and Andrew Quintman (eds.) Himalayan Passages. Tibetan and Newar Studies in Honor of Hubert Decleer. Studies in Indian and Tibetan Buddhism. Boston: Wisdom Publications 2014, 45-68. Von Rospatt, Alexander. “The Sacred Origins of the Svayaṃbhūcaitya and the Nepal Valley: Foreign Speculation and Local Myth,” in Journal of the Nepal Research Centre 13. Kathmandu: Nepal Research Centre 2009, 33-89. Von Rospatt, Alexander. “‘The Past Renovations of the Svayambhūcaitya,’ in Tsering Palmo Gellek and Padma Dorje Maitland (eds. ), Light of the Valley. Renewing the Sacred Art and Traditions of Svayambhu. Dharma Publishing, 2011, 157-206. ↑ Puranas (“tales of old”) is a genre of Hindu scripture which constitutes a vast body of literature. Puranas entail historical information blended with legend and myth. The Swayambhu Purana is an exceptional case, being the only Buddhist text that associates itself with the puranas. ↑ This is in accord with geographical findings. When digging deeply into the soil of the valley, mainly for water, one finds a lot of sand residue from the ancient lake. Many fossils have been found in the valley, too. ↑ Both a city and a country, 160 km east of Bhagalpur (24°52′0″N 88°8′0″E). However, the precise location and extend of Gauda remains unknown. For more information, see: Ramesh Chandra Majumdar, History of Ancient Bengal, (Calcutta: Kali Press, 1917), http://www.dli.ernet.in/handle/2015/98674. ↑ This summary is mainly based on Von Rospatt, Alexander, “The Sacred Origins of the Svayaṃbhūcaitya and the Nepal Valley: Foreign Speculation and Local Myth,” in Journal of the Nepal Research Centre 13, (Kathmandu: Nepal Research Centre 2009), 58-9. ↑ The French and English translations of the Padma Kathang state that Guru Rinpoche met Shakyadevi in Sankhu. However, the event actually took place in Swayambhunath and not in Sankhu. In the Tibetan version the sacred site is called Shingkün (Tib. shing kun gtsug lag khang la), which is the name Tibetans use to refer to Swayambhunath. See Erberto Lo Bue, “The Role of Newar Scholars in Transmitting the Indian Buddhist Heritage to Tibet,” in Les habitants du toit du monde. Hommage ά Alexander W. Macdonald, (Nanterre: Société d’ ethnologie, 1997), 631, footnote 7. And in Tibetan: o rgyan gling pa, pad+ma bka' thang, (khreng tu'u: si khron mi rigs dpe skrun khang, 1987), 325 & 358. Keith Dowman’s Guide follows the English translation of the Padma Kathang as well, since when he inserts the account of Guru Rinpoche meeting Śākyadevī, he cites the page numbers of the English translation. See also: Keith Dowman, “41. 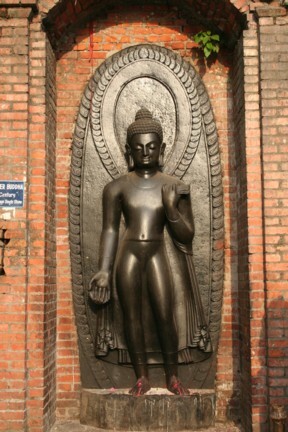 Sankhu Bajra Yogini,” A Buddhist Guide to the Power Places of the Kathmandu Valley, http://keithdowman.net/essays/guide-to-kathmandu-valley.html#SANKHU. And: the explanation by the 4th Khamtrul Rinpoche in A.W. Macdonald and Dvags-po Rin-po-che “A Little Read Guide to the Holy Places of Nepal – Part II” in Essays on the Ethnology of Nepal and South Asia, vol. II, (Kathmandu: Ratna Pustak Bhandar Publishers, 1987), 106. In order to prevent confusion, please note that the Padma Kathang refers to the Boudhanath Stupa as Swayambhu, “naturally arisen”, stupa. This page was last edited on 13 February 2019, at 07:23.